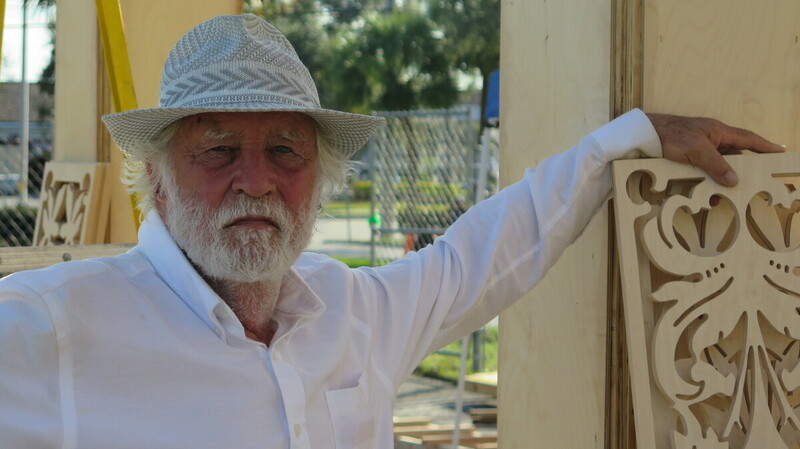 Artist David Best Will Mark Parkland Anniversary With Temple Of Time The artist whose massive wooden structures have become a fixture at the annual Burning Man festival is now constructing a Temple of Time to help mark the first anniversary of the shooting. A view from inside the Temple of Time, which artist David Best is building in Coral Springs, Fla., to help pay tribute to victims of the 2018 shooting at Marjory Stoneman Douglas High School. About a 10-minute drive from Marjory Stoneman Douglas High School, on an empty lot across from city hall in Coral Springs, Fla., a temple has been slowly taking shape. Sheets of beech plywood have been milled into intricate, lacelike designs. They will form the walls and ceiling of a nearly 40-foot-tall structure that artist David Best calls the Temple of Time. When asked to describe it, Best is reluctant. "I could ... say it looks like a Balinese, or a Tibetan, or a Hindu, or an ornate Gothic cathedral," says Best. But "it's more what they feel like," he says, "than what they look like." In Parkland and other communities across South Florida, instead of candy hearts and flowers for Valentine's Day, Feb. 14 will be a solemn day of remembrance and grieving. As the anniversary approaches of the day 17 people were killed at Stoneman Douglas, the temple that Best and a crew of volunteers is building is not for prayer but for paying tribute. Once it is complete, it will serve as a destination for visitors to bring their grief and pain over last year's shooting. Then, it will be set on fire and destroyed. It's part memorial, part community art project, says Best. "The temple that we're building here requires participation," he says. "This community who suffered a tremendous amount of loss is coming here and participating in building it." Best is from Northern California and has been building temples like this since 2000. He got started at the annual Burning Man festival in the Nevada desert. His first project commemorated the death of a friend who died in a motorcycle accident. The second year, he and his collaborators built a larger, more ornate structure remembering those who had taken their own lives. "That year, 500 people put in the names of people who had taken their life," he says, "and we burnt it on Sunday night." Best's massive wooden temples have become a fixture at the annual Burning Man festival in the Nevada desert. 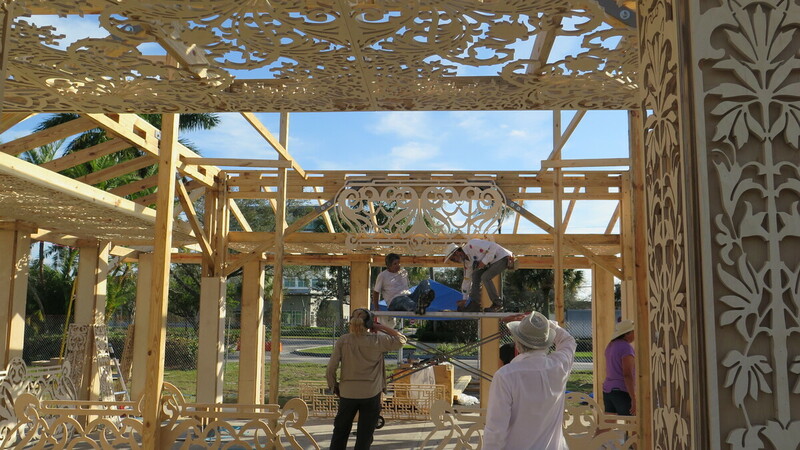 The crew building this one in Coral Springs includes many people who work with him every year at Burning Man and on other temples as well as locals from South Florida. At the site in Coral Springs, Best's crew of volunteers is using glue, nail guns and power saws to slowly bring his design to life. The crew includes many who work with him every year at Burning Man and on other temples. But it also includes locals from South Florida. Among the locals is Margaret McCourt, a Parkland resident, who on one recent day was busy gluing small wooden pieces to a large sheet of birch plywood. Nearly a year after the shootings, McCourt says the deaths at Stoneman Douglas are a deep pain that still take her breath away. "We lost friends, so there's no getting over this. You just have to acquire the tools to deal with it. And if this gives people tools to deal with it, this is a good thing." Paul Walker, one of Best's regular crew members, says visitors will often leave behind photos or other mementos of loved ones. That's what happened in 2015, when some 80,000 visitors traveled to Londonderry, Northern Ireland, over the course of a week — many to pay tribute to victims of the violence there between Catholics and Protestants. 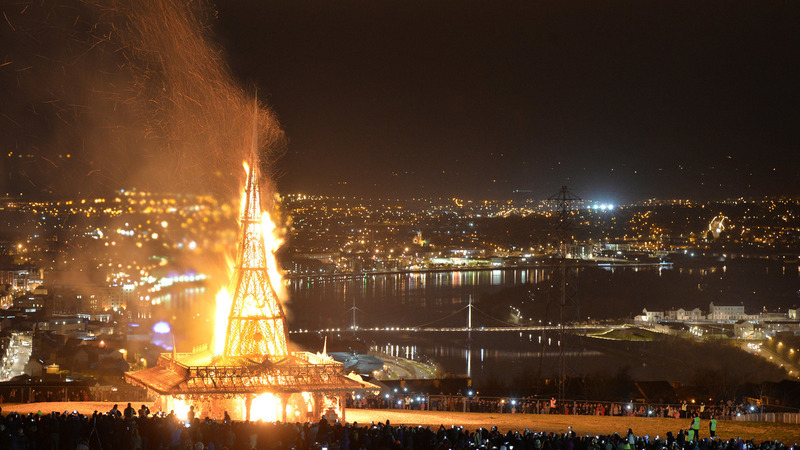 Thousands of people watch as the temple by renowned Burning Man artist Best is set ablaze on March 21, 2015, in Londonderry, Northern Ireland. Soon, Walker expects the entire structure will be covered in writing expressing visitors' emotions, everything from anger to fear. "It's a medium for you to put these things into there," he says. "And eventually ... several months down the line, this whole thing will go up in flames." The Coral Springs Museum of Art brought Best and his crew to the area with the help of Bloomberg Philanthropies and a $1 million grant. For the museum, the project grew out of an art therapy program started for students after last year's tragedy. Les Gordon, a family therapist who works with students from Stoneman Douglas, is one of those helping build the temple. The first anniversary of a trauma like this, he says, is especially painful. "Some people choose not to go to school," he says. "Other people just want a quiet day fishing. Some people want to be with other people and go to the garden or come here to this wonderful, expressive artistic therapy." Best says his temple is intended to help the people of Parkland and Coral Springs. But he would never call it a "temple of healing." He is not a healer, he says. "I'm not capable of doing that," he says. "This is the Temple of Time. It will take a long time for this community to get over what it's experienced." The temple will be open to the public until mid-May. At some point that month, when the weather and fire marshal permit, the temple, along with whatever objects visitors leave behind, will be set on fire.